Encase yourself in luxurious comfort while you soak up the amazing sights, sounds and warm sunshine of beautiful Wailea, Maui. From the moment you walk in to your contemporary ocean-view condo, you’ll know you’ve chosen a wonderful home base from which to rejuvenate between excursions into the island paradise that surrounds you. While in your condo, you’ll feel completely comfortable. Recently renovated by an award-winning architectural design team, Ekahi 53D features a state-of-the-art kitchen, a newly re-carpeted living room, a designer bedroom with king-sized bed, marble bathroom and elegant furnishings throughout the unit. The secluded lanai faces a beautiful ocean view, along with splashing humpback whales, when in season. Ekahi 53D also features countless amenities designed to make you feel at home, including brand new multi-unit air conditioning system, outdoor Weber barbecue, flat screen HDTV, wireless internet access and DVD/CD players. Plus, you'll find ample beach towels, chairs, umbrellas, and coolers in the unit for your convenience. You will never want to go home. Step outside, and Wailea’s inviting Keawakapu Beach stands ready and waiting, just a short stroll from your front door. Additionally, four pools, each unique and immaculately maintained are scattered throughout the property, including a large oceanfront pool and family dining area. Indulge in the floral scents, the breathtaking sunsets, the soothing feel of the perfectly refreshing temperature of the Pacific Ocean. Venture off in the other direction and discover the luxury spas, fine dining and world class shopping that make Wailea one of the world’s most spectacular resorts--and all within walking distance. This wonderful rental condo is ideal for honeymooners or couples just looking to get away from it all. There are also two twin-sized futons that can be provided to accommodate two extra guests. Ekahi 53D sells out quickly. So stop dreaming about it and make your perfect Maui vacation a reality today. What are some fun things to do at your vacation rental? The Ekahi Village has four unique pools scattered throughout, including a “quiet pool” that is just a minute walk from the unit, as well as a large ocean-front pool that is about a four minute walk away. The large pool has a picnic area, cooking area, refrigeration facilities, barbecues, showers, rest rooms and shuffleboard. Beyond the property, you are in the heart of one of the nicest resorts in the world—award-winning beaches, countless outstanding restaurants, world-class shopping and all the best Maui has to offer in terms of water sports, hiking and golf. What are some fun things to do beyond the property? The south side of Maui features a wide variety of sun-drenched, outdoor options. For golfers, there are several world-class golf courses, all within a few minutes drive. For those who love the water, the string of beaches throughout Wailea is unmatched in the world—each with its own unique personality. To the north, you’ll find world-class surfing waves. To the south, you’ll find waves that are ideal for swimming & boogie boarding, as well as calm coves where the snorkeling is beyond description. How is the beach at Ekahi Village? Constantly recognized as one of the top beaches on Maui, Keawakapu Beach was recently described by New York Times as “South Maui’s hidden jewel”. The ultra clear waters of Keawakapu are ideal for snorkeling, swimming and safe boogie boarding. And the occasional afternoon trek of sea turtles just off-shore is a once-in-a-lifetime experience. 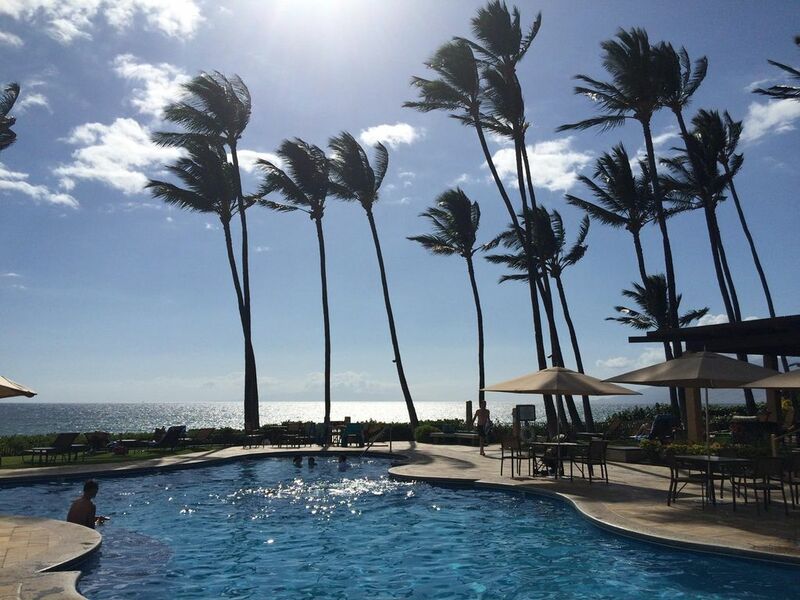 What can you tell me about Wailea in terms of shopping & dining? Just south of Ekahi 53D, you’ll find some of the world’s finest shopping and dining experiences. The Shops At Wailea is just a short walk away. Considered the most unique shopping experience in Hawaii, this elegant outdoor mall has it all—top fashion retailers, artisan gift shops and a wide range of dining options. In terms of restaurants, you’d be hard pressed to match the density of fantastic dining in Wailea anywhere in the world. Local favorites, such as Longhi’s, Gannon’s, Duo and Ko mix with big names such as Spago, Ruth’s Chris & Tommy Bahama. You can literally walk to a different amazing restaurant every day for several weeks without eating at the same place twice. What makes unit 53D special? That’s easy—53D is in fabulous condition. Recently renovated by an award-winning architectural design team, Ekahi 53D is contemporary, comfortable and full of great amenities. Inside the unit, you’ll find a state-of-the-art kitchen, designer master bedroom and spacious bathroom all kept at your ideal temperature with brand new multi-unit air conditioning. The living room includes ultra-comfy furniture and a flat-screen TV. Outside on the lanai, you’ll find a beautiful straight-on view of the blue Pacific, comfortable furniture and a personal BBQ unit. If you’re looking for a spacious, comfortable place to set up camp and enjoy Maui, 53D is the ideal spot. Ekahi 53D sells out quickly, so book it today! NOTE: The main pool pavilion will be under construction from approximately mid-April to mid-Oct of 2019. Guests will still have access to the main pool, beach, shower and temporary bathrooms during this time. Craig & Andrea Jacobin manage Ekahi 53D, along with support from Diane Morrison. Craig & Andrea live in Laguna Beach, CA, where Craig is in Advertising and Andrea is in Healthcare Management. Diane is Craig's mother and is an accomplished Educational Consultant and Art Dealer living in Denver, CO.
We acquired Wailea Ekahi 53D because it is one of the most beautiful properties in the village and the ocean view from the lanai is amazing. But most importantly, it is perfectly located within Wailea--which is easily one of the most amazing resorts on earth. Ekahi 53D is a luxury condo that is lovingly cared for with state-of-the art air-conditioning recently installed to ensure your comfort. The unit is always well kept and extremely clean. Ekahi 53D is just a short 4 minute walk to a world-class beach, perfect for sunbathing, taking a dip or snorkeling. The unit offers straight-ahead views of the ocean, as well as nightly stunning sunsets from the lanai. It is also conveniently located within a short walk of all that Wailea has to offer--world-class spas, shopping, golf and dining. Marble shower with American and European fixtures. Separate sink area with beautiful sink. Granite counter top and oil rubbed bronze fixtures add to a luxury look. Vanity includes plenty of storage. Endless fluffy towels. Starter soaps and bathroom supplies provided. Hair dryer available. Five miles of the finest beaches in the world. Gorgeous, soft sandy beaches face the beautiful blue Pacific--perfect for swimming, snorkeling and boogie-boarding. And the water temp is ALWAYS perfect! Ekahi 53D is just a short 3-4 minute walk across a beautiful greenbelt. The large family pool is right next to the beach, making it convenient for showering. Just a short walk to Wailea's world-class stretch of resorts, including Andaz, Grand Wailea, Maui Four Seasons and The Fairmont Kea Lani--each with several amazing restaurants and spas. Ekahi 53D is in beachfront Ekahi Village, featuring 4 pools scattered throughout. The main large family pool is ocean-front and includes an extensive dining area, showers, public BBQs and kitchen. Spectacular straight-on view of the ocean from the lanai, living room, dining room and kitchen. Amazing sunsets every night as the sun dips into the blue Pacific. Beautiful view of Haleakala from both both the front porch and the master bedroom's stand-up balcony. Split system with thermostat in bedroom and remote in the living room. Luxury linens 400+ count. Blankets, duvet if needed. Variety of pillows--feather or non allergenic. Ample supply of bath and beach towels. Luxury furnishings/accessories, original oil paintings, flat screen TV. New GE refrigerator with filter and ice maker. New GE stove with four electric cooking burners. New GE oven, convection and traditional. Automatic coffee maker with timed brewing functionality. Great variety of formal and casual dinnerware, including baking items, wine glasses, plastic glasses for the beach. Granite counter tops, new GE appliances. Great view of the ocean. Round glass-top table with Hawaiian-style furniture. Throughout the Wailea Ekahi Village. Main lanai, plus smaller private balcony off of master bedroom. Several courses within a mile. Second floor unit. Just 1 flight of stairs. 3 adult-only pools are also scattered throughout the Ekahi Village--one is just 100 yards from the unit. 1 large family pool next to ocean. Features lounge chairs, shady pavilion, BBQ area, full kitchen, snacks/drinks for purchase, shuffleboard. Stairs lead right to beach. Bathrooms & showers on site. Extra Special Features: Ocean view! 4 minute walk to spectacular 5 mile beach. Totally renovated by architect/designer team. Granite kitchen with state of the art appliances and accessories. Designer-inspired decor in all rooms. Plantation shutters. Cathedral ceilings in living/dining areas. New air conditioning just installed. Ceiling fans. Full size washer/dryer. Weber grill on the lanai. Flat-screen HDTV, DVD/CD. High speed internet with Wi-Fi. Phone with answering machine. We were thrilled to be able to find this gorgeous condo on short notice as the one we had booked had unbearable construction happening when we arrived. Craig was always excellent to communicate with, offering lots of valuable tips to make our holiday even more enjoyable. The only issue was that the extra bed is not a pullout couch but futon-cushions for the floor. Otherwise it was well stocked, very clean and the perfect location for the sunset view over the ocean. The grounds are lush with flowers and foliage and 2 out of 3 pools are “quiet pools” for those looking for kid-free time. We found the beach is the sandiest (no rocks at all!) of all the others we explored and the black rocks made for amazing snorkeling. We swam with turtles, saw loads of different fish and even an octopus all along our reef and towards the Marriott. We highly recommend staying here and look forward to returning very soon. Great property with beautiful sunset views from the balcony. The walk to the beach and pool could be challenging to anyone with mobility issues. The street noise prohibited us from sleeping with windows open. Overall a well equipped, clean condo. 4 time repeat renter - amazing each time! We love return guests! Thank you so much for the nice review. And please do come back soon. What a wonderful 11 days in Wailea........Craig the condo was wonderful, the views spectacular, the whales could be seen from the lanai and the sunsets were amazing. We have been to Wailea several times and always stayed in lovely places, but the convenience of the ocean just a 5 minute walk makes us want to come back sooner than later..... All of the conveniences of home with an ocean view. Thank you and hope to be back soon.. Thank you so much for the wonderful review. Have a terrific holiday! Thank you for the nice review--we're so happy that you had a nice time. Please come back soon. Beautiful ocean view condo with great sunsets! Overall we had a very nice relaxing stay. Beautiful quiet grounds, great views from balcony. Convienient location to shops, restaurants, pool and beach. Place had everything we needed to prepare meals, BBQing, blender for drinks. It would be nice to have a new non stick pan. Carpets need to be cleaned near kitchen/dining area. Some bug issues by kitchen sink. Moisture seeking? We kept all food out of area and tried to keep the sink dry. You could provide paper towels and toilet paper. These are only suggestions for a better visit next time. Wailea is a stunning, world-famous resort that still has an island feel on the lovely, sunny, south side of Maui. Wailea is famous for its miles of pristine beaches that vary in personality from quiet coves ideal for swimming, paddleboarding and snorkeling, to those for the more adventurous who may want to boogie board or surf. Wailea features several 5-star resorts within a 2 mile stretch (Fairmont Kea Lani, Four Seasons, Grand Wailea, Marriott Outrigger, Andaz), each with a variety of amazing dining and shopping options. There are also several world-class golf courses and two tennis clubs with lights and available instruction. At Ekahi 53D, you won't need your car to walk to the beach, dine ocean front, shop snorkel, paddleboard and more. If you have never been, Wailea is a place you'll fall in love with immediately. And if this is a return visit, we're definitely not surprised. Rates listed are for two people. There is a $25/night fee for each additional guest. There is a 4 night minimum stay. Complimentary mid-stay housecleaning for bookings of 2 weeks or more.